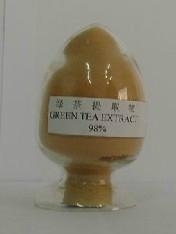 Tea polyphenol is natrural green tea extract, powerful antioxidant. It has the functions of antibiotic, antiviral, anticancer, blood lipid lowering and other health protection and pharmacology effects. Tea polyphenol is stable under PH4-8,soluble in water and ethanol,nontoxic.It should be stored in dry,clean,cool , ventilative places and avoid direct sunlight. We can manufature all kinds of specifications of tea polyphenol according to the customers' requirements.